The more I write about Drupal, the more I want to. The more I compliment Drupal, the more I’d like to. But this blog post is about how to list your Drupal website on some of the (other Drupal) websites to get you more exposure and more traffic equating to more lead and sales. 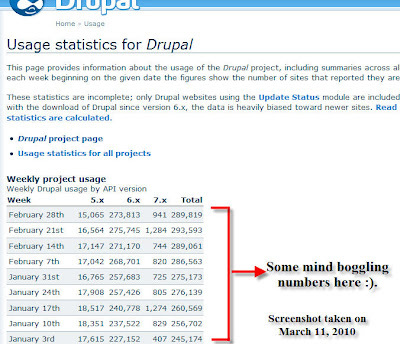 Arguably Drupal is the best open source content management system out there, Drupal project usage statistics here show around 40 thousand downloads a day for Drupal core (including 5x, 6x and 7x alpha releases) for last 6 months or so. The 5 websites listed below are basically ideal places to showcase your Drupal site that you have build. Among the 40 thousand downloads if only 1% are deployed live daily we will have around 4 hundred new Drupal websites every day and these websites need some publicity, promotion and exposure so below are the (other Drupal) websites that list and showcase Drupal websites. Without doubts, you can’t get more publicity about Drupal anywhere else than Drupal.org. 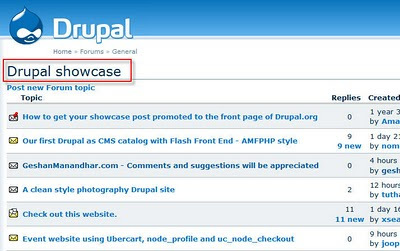 The drupal.org forum “Showcase” section here gives you a place to list your website and let all other Drupalites see it comment on it and suggest you changes. If you are a member of d.o (which you might be as you are reading this blog post) then you can post about your website/web application or web project built in Drupal here. It is just a forum so you don’t have the option to post any screenshots but it works fine. If you follow the guidelines given here, and land in the Drupal.org homepage then you might get more traffic than you would have expected. 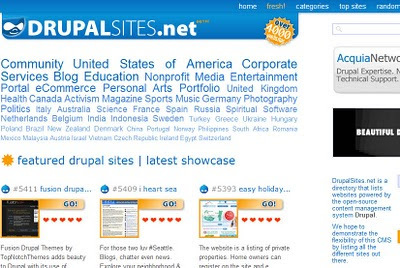 Drupalsites.net can be termed the unofficial Drupal website listing and showcasing website. 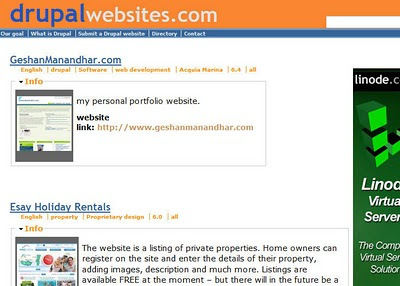 Its the ultimate Drupal website directory with currently 4043 websites listings. Its also easy you can register, login with Open ID or your Drupal.org username as well. After you login you can add your Drupal website here. It’s easy and your website is listed instantly just remember to take a screenshot of your website of at least 600x600px to upload to DrupalSites.net. Drupalsn.com is short for Drupal Social Network a very good website for Drupalites of all types developers, themers, module users etc. 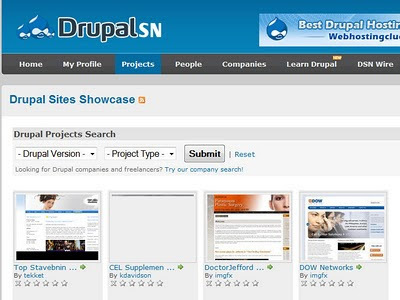 The project page of DrupalSN here showcases all the projects submitted by website members. After you sign up and login, you can submit your drupal project here. A good thing about DrupalSN as DrupalSites.net is that the project is shown instantly after you submit it without moderation. Showcasing Drupal projects is just one part of DrupalSN, you can post a question or a resource link to the website which can help other fellow Drupal users. I have put two websites DrupalMa.com and DrupalMuseum.com here together because the way they funtion are same, both the websites do not allow users to directly submit their website and only showcase “the best well designed Drupal based websites” or in other words “websites that are pleasing to the eye, as well as useful”. 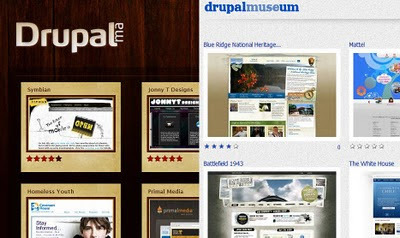 So you can submit your Drupal website to DrupalMa.com here or DrupalMuseum.com here but if your website does not meet the above criteria then your website will not be listed on the showcase. If you think you have a great designed website try submitting to the two sites mentioned above :), best of luck ;). Last and may be the least, DrupalWebsites.com is a Drupal 5 website that also works in a similar fashion as Drupalsites.net but seems to be a little old now. It also has a Drupal Module for Drupal 5 to submit websites but I have not used it, so I can’t really tell how it functions. You can login with Open Id as well and this listing directory website will also need your website’s screenshot to list your website. This site should really work on its design and upgrade and update. Listing website in other reputed websites really helps you promote your website, back linking, link sharing can benefit your Search Engine Optimization and your website visit by referring websites. So, after you make your Drupal Website live don’t forget to add them to the above sites to get more traffic, more lead and more sales :). Happy Drupaling.